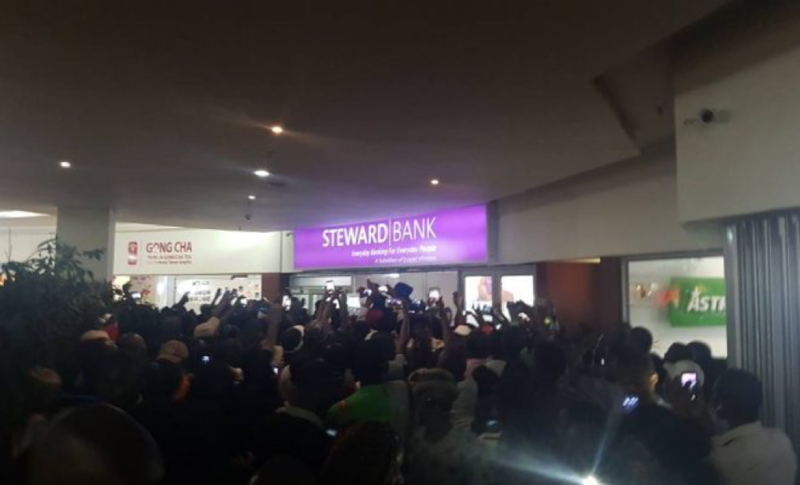 Business literally came to a standstill at Joina City Mall on Thursday when Steward Bank hosted Davido at their branch where the Nigerian music star met and signed autographs for fans. Steward Bank surely made their presence felt when they invited the ‘Fall’ singer to be their guest at Joina City Branch where hundreds turned up to catch a glimpse of Davido including those who could not afford to attend the concert scheduled for tomorrow at the Harare International Conference Centre. “Oh my goodness! I met and hugged Davido at Steward Bank and I’m so excited since I can’t afford the ticket,” screamed one excited lady only identified as Danai. Another customer also took advantage of the ‘meet and greet’ session to have a selfie with Davido at the bank. The mall which was painted purple with branded material from Steward Bank including banners, leather sofas and backdrops, served as a perfect setting for Davido and his entourage. Security at Joina City Mall had to close the gates as part of the crowd control as more people wanted to make their way to Steward Bank. Joina City branch manager Letwin Svinurai swiftly called for more security to avert near stampede. Steward Bank has been at the forefront of innovative market penetration including last year’s Ras Vikela campaign for Kwenga POS machine. Kudos go to the chief executive Steward Bank, Dr Lance Mambondiani, for changing the face of banking in Zimbabwe. Dr Lance is becoming popular for his creative and innovative campaigns in reaching out to as many people as possible. Steward Bank has within few years of existence become the biggest bank in Zimbabwe on customer base sitting on close to 700k active customers. Over and above this, Steward Bank has a record of first especially tailored to reward its customers for their loyalty.